At the WWDC (s aapl) keynote this week, Steve Jobs remarked that when trying to teach someone how to use a Mac, “everything’s going along fine until you hit the file system, and then the difficulty is staggering for most people.” I remember having my own difficulties understanding file systems back when I was a computer neophyte, and I’m sure others would agree. On iOS, this learning curve is non-existent, as it has no file manager. Instead, apps use a “library” metaphor, where each app is responsible for presenting its own documents. For example, when you launch Pages for iOS, you get a view of all your documents, so you can swipe through and choose one to edit. 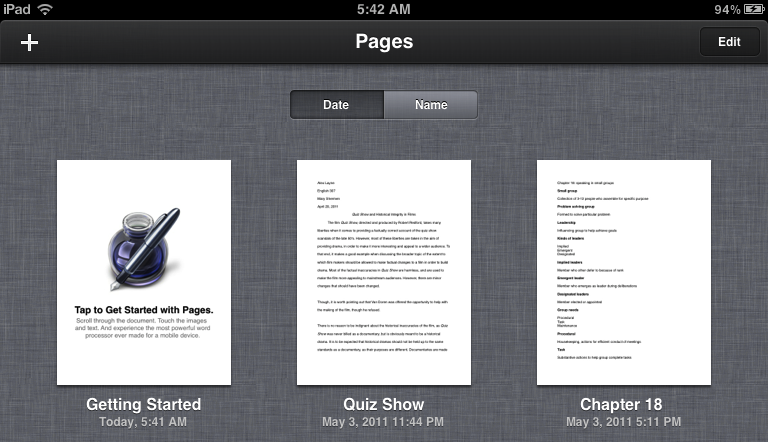 Pages for iPad uses a library to display its documents. But how can Apple make file management easier on the Mac? Truth is, it has been laying the groundwork for years. The iLife suite, iTunes, and Photo Booth have used the library system since the beginning, and I suspect a new version of iWork will come out that does the same. Apple is furthering this groundwork with Lion; Auto Save, Versions, and Launchpad are all designed to be easier alternatives to using the Finder. AirDrop, the new simple local file sharing tool, is also part of the transition, even though it’s integrated into the Lion Finder. All Apple has to do is take it out of the Finder, and integrate it into each app’s library. Another piece of the puzzle is iCloud, which makes syncing files across multiple devices easy, requiring no intervention on the user’s part. iCloud has the potential to make drag ‘n’ drop file management a thing of the past. No more copying that important Keynote presentation from one Mac to another with the Finder; With iCloud, it’ll already be there. It follows that in the future, we could see a Mac OS where there is no Finder, and none of the complexities that come with it. When you want to work with a document, you’ll just fire up the app that’s associated with it and select it from the library. Shared libraries could work between apps, too, like they do now with iPhoto and other Apple apps. There won’t be any need to save files, or launch applications with the Finder; the OS will take care of that for you. All this isn’t to say that it’ll be easy for Apple to replace the Finder. There are still questions that remain unanswered. For instance, how Apple would deal with downloads or the Desktop folder. Despite this, I have little doubt that Apple will continue to move us towards a Finder-less future. The gains in terms ease of use are simply too great for Apple to pass up. What are your thoughts? Should Apple ditch the finder, or are the compromises required too great? Apple has definitely been trying concepts and introducing the more successful ones that can be used to replace the finder. I personally don’t find it difficult to user, but I find it inefficient and it certainly doesn’t work well with how I work. The introduction of iOS devices has certainly sped-up the need for change, as the need to transparently and painlessly have documents available on all devices is more pressing. So maybe Lion is the last version of MacOS X, the next version might see the finder gone completely! Personally I exepect the transition to be more graceful as so many people are wedded to the desktop metaphor. Part of the reason I switched to macs 12 years ago was the finder and part was that Apple was so user friendly. the friendliness has been replaced by control attempts. You don’t need a matte screen; you will download software from the app store or do without. It is getting to the point where my Windows experience don’t sound so bad at all. I have 3 macs. They all run Snow leopard and It looks like they will not be updating to Lion. When they need to be replaced, we’ll see what happens, but the current trends at Apple make me wonder if Apple is really interested in serious users. There is an inherent trade-off between convention and innovation. Human brains are hardwired to be displeased at all instances of convention breaking, but break no conventions and you will soon find yourself confined to the dustbin of history. 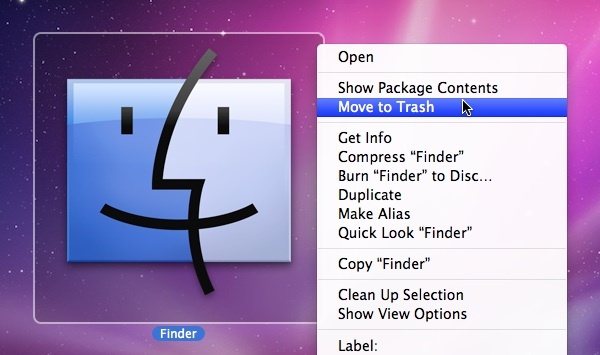 Apple attempted to remove the Finder in the original OSX beta, later refreshing its function in the released version. In earlier versions before OSX Apple tried a Launcher that was scrubbed in an update. Change just for uniformity in appearance is not an improvement to an operating system. Finder works, it works very well. Leave it alone. Why do you think the App Store was put on the Mac? They want the OSX system to be exactly like the IPhone/IPad systems since people love their IPhone Apps. Problem is the IPhone/IPad Apps are designed to do one thing well. The programs on my mac can do MANY more things and are multi-faceted and can work offline. Apple seems to forget these facts and wants to dumb everything down and charge use for it. If this happens I won’t be able to do my work on the Mac. Say hello to Linux or Windows7 OS. Apple is thinking one size(OS) will fit all. Is their R&D and marketing department brain dead? Do they even listen to their power users/business customer base anymore, or just the teenagers who text and play games??? Did they secretly hire Steve Ballmer to sync OS integration? What is going on up there? IMO I think Apple will move towards the iOS way of displaying files with their “main” app, although keeping the Finder in a more stealthy place, just like they did with the Terminal. There will always be an audience for both, but it’ll be a more specialised one. Newbies that don’t even have a computer will be better with this approach and it won’t cut off the current users that are used to it. If you’re too dumb to grasp the finder perhaps you shouldn’t be using a computer to start with. I am all for simplification, but it just happens to be that I have “projects” that require combinations of different types of files. Rather than having to search for the files in the applications, I prefer to search for the project, and open the appropriate applications with the right content immediately. They might try to hide it, but kill it? Ridiculous. Many of us live in the Finder. Hell no! â€“ Rethink it, sure, but never ever remove the ability to navigate and organize files and folders! But I use the finder all the time. I would have to change how I picture what I have and where is is saved. Not saying I couldn’t adapt, but there is a virtual steel file cab in my head. Many years ago, in my first computer class, the COBOL compiler would refuse to run a job because of a missing period at the end of a line. But then it would tell me that the period was missing! Why couldn’t it simply put the period in for me and keep going? In many ways computers haven’t gotten much smarter when dealing with typical human errors. Today for example, I can’t open a file sent to me by a client if they call the file May-inventory. Apple is on the right track by trying to make the Finder irrelevant. They just need to make sure that it’s always easy for appropriate applications to share/access the necessary files. Most users don’t care where their files are actually stored (yes I know that it’s important for web developers to structure their directories properly, but most people are not web developers). There are instances where the lack of iOS file system is really inconvenient. Like when I find a nice photo of the kids on my iphone that I want to email to the folks. So the Photos app creates an email with my selected photo. Then I figure They would appreciate a few more pics but alas I can’t just attach a photo. I have to abandon that message, return to the photos app and make sure I have all the pictures I need selected. Usability here would certainly benefit from some kind file system or at least an option to attach photo/document from supporting apps on iDevice. And how frustrating is it when you want to open a file in another application. File systems are just part of the way a powerful operating system works. Take this away from me and this Mac would be the last one I buy. So is it the file system that is a problem, or the fact the Finder itself is nearly unusable? I’m a Mac fanboy, but I’d rather be stuck with Windows explorer than Finder. Newbs using Windoz don’t seem to have issues getting up and running with the filesystem. I work in an area of about 20 people. We generate about 10,000 unique files each month (mostly copies of previous month’s files, modified). We are heavily dependent on a file system, to the extent it’s almost hardcoded in the corporate DNA. That said, I’m disappointed by the reactions in the comments below. Getting rid of the file system means getting rid of something that works and that you’re comfortable with. But maybe, just maybe, there’s a better way. Andrew has a desire to organize things how he wants. Why? Roger notes (correctly) that the iPad is not viable for business use for many (or most) uses. That’s a point against getting rid of a file system, but doesn’t mean it’s impossible. Mike likes hierarchical folders and doesn’t believe that there’s a better way that lots of data/files can be organized or retrieved. To everyone: think of the internet. There are more data and files and sites and pictures on the internet than on your hard drive by several orders of magnitude. Do you use a hierarchical file system to find things on the internet? Well put Patrick. Nice to hear a voice of reason. I for one still use a hierarchical file system to save my files, 9 time out of 10 I use search to locate and open them (via spotlight or launchbar). I think your example of the Internet is an apt one, and over the last three years or so search has taken over most of my workflows. I don’t for example use any form of filing system for email (or notes), they are strictly search based. While I like Finder, I’m open to new ways of working with files. This article raises a valid question. I think it could be really useful to have less reliance on the Finder, and even eventually a Finder-less MODE for casual users. Pros will always need a file system, however. I can’t ever see a future where I can do audio and video editing without a file system. Even if you could somehow come up with a way to make it work, it wouldn’t be as efficient, and it would take a lot of re-training. Please don’t take my File Manager, er Finder, away from me. It’s the first icon I use and the last one I close down. Even on my iPod touch I use iNotes with gobs and gobs of nested folders. It ain’t broke — so don’t fix it. Apple has been making moves for years. When apple made changes to file and resource types with Snow Leopard, that was the biggest. With Leopard, Apple telegraphed that the file and resource changes were coming. With applications presenting their own files, Apple needs to come up with a better method than the Services submenu for applications to share features with other programs. Realistically, it’s the Finder that makes a Mac a Mac for most users. The applications don’t vary much platform to platform (Word, Photoshop, Firefox, etc.) so the bulk of the user experience is tied to the Finder and file management. But the ICloud will be the hub now as Jobs plainly stated. Not the Mac or the Finder. You must conform to the Cloud or be a outcast rogue Apple user. Open wide! Apple is going to shove this hot mess down our throats like M.S. did with the Vista release. We all know how well that went. Maybe I should sell my Apple stock before Lion is released? Bosh! I’ve worked in offices with lots of people. “Most people” don’t have trouble with file systems.” That’s an obvious metaphor. Steve Jobs’ definition of “most” are probably secretaries who get flustered when he begins to yell at and curse them for not coming up with something instantly. He’s the problem not a filing system, physical or digital. What people have trouble with is finding where something in despite a file system. Eliminating folders only makes a bad problem infinitely worse. Instead of having to look through 10 folders, 8 of which obvious don’t have the document, they must wade through a list of 100s of files with often cryptic names. No, creating one enormous string of files undifferentiated by anything certainly isn’t the answer. Nor are Spotlight-like searches.That’s merely another way to get a hideously long list. I can find something in folders far quicker than I can locate it via a Spotlight search. What Apple could do that would help would be to make keyword tagging of text much, much easier. It should be part of the file-save window not buried in some other apps. Proper tagging combined with a file system would be marvelous. Between the two, we could find almost anything. I might add the iOS as it is actually used disproves the idea. For a number of types of apps, the lack of an ability to handle folders is an automatic no-buy. That’s why more and more of them understand folders. Try using an iOS app that doesn’t understand a folder-like structure. Unless you relentless weed out apps, the long lists quickly become unmanageable. And if you throw stuff away that aggressively, you don’t need any file or find system. Your only question is become is it the first or second file? I’ll repeat an earlier remark. Apple needs to radically improve file tagging, making it far easier to use, not get rid of or even diminish the file system. Dude, the Finder shouldn’t be taken out. I think you’re over thinking Apple’s intent. The reason Finder exists is to simplify a file system. It is WORLDS better than the Windows configuration. In my opinion, taking away Finder would do exactly the opposite of what you think it would. People should have control over these things even if only a little. Professional users want access of this nature. Would you have Apple eliminate that demographic from using OSX? Let’s put this into full perspective. I have been a PC user for 23 years. After playing with a few Macs and reading opinions on them, I purchased my first Mac just 3 weeks ago. In the first few days, I slowly migrated my files from my Dell laptop to my new Macbook Pro. After using PC solely for 23 years, I will begrudgingly tell you that the Finder system is 100% easier to navigate as a novice Mac user. Mac Finder makes sense while I am STILL confused when searching through the myriad of folders on a PC. Apple has quickly won me over and I can’t see myself returning to a PC. Control over what, a mess is not control. We use it because it is what we have grown up with but not because its a great idea. Ok so, everything I write with a pencil I put in the box with the pencil. Ink pen stuff goes in that box. If I color a picture, put it in the box with the crayons. This makes no sense to me. Why do I have to remember which tool created the document? What if I need to group documents by project or client? The file system makes perfect sense to me. You are thinking about the files on your computer as physical objects (i.e. a picture in a box with crayons) – where the physical object can only be in one place at a time. Computer files don’t have to work that way, and if you think about them as physical objects that go into a file drawer you are unnecessarily limiting yourself. For example, what if you organize your projects in directories and a pricing spreadsheet is used for multiple projects? You probably make multiple copies of the spreadsheet to keep it together with the rest of the project’s files. But now you have several copies of the same thing (wasting space) and you have to maintain multiple copies if the prices change (wasting time and possibly making mistakes). Applications like Yep, Leap, and Deep already make this possible to a large extent with all our files. I’m surprised Apple hasn’t allowed themselves to be a bit more inspired by examples such as these. It would also be nice if Apple could allow us to add fine-grained metadata such as tags on individual slides in Keynote. Instead, Apple seems to be going the other way, with the latest version of iPhoto making it much more unwieldy to add or view tags. i don’t see how hard of a concept a finder is. you move things around like a real world objects. Granted, the finder isn’t the best but taking away a file manager doesn’t make it better. Give me any device and the first thing I do is look for a file manager. Whether it’s DOS navigator or Nautilus. I’d preferably like something with two panels to move files from one place to another is annoying that finder doesn’t provide which instead you have clumsily line up two windows. I’m thankful for Totalfinder. if I was Apple I would make finder more like Totalfinder or Pathfinder. if anything Apple should be integrating some of the apps into the finder more. You shouldn’t know the difference between the finder and the main apps. Well look at this way. Your write something in pencil and the OS understand now which pencil you used. it also know what that pencil did and for whom it was for. It then know where everything is, so that next time you forgot because of your old age :-) that you left file X in folder Y which you forgot to put in Z hard drive but actually left it in flash drive B it will ask you, hey remember that you need to get me Flash Drive B for me to access this file or better yet, you have a copy of file X in your iPhone would you like me to get that one. Oh my why yes thank you computer. It know where everything is because its all attached to the cloud. Now for those people who are paranoid and think the police is coming to get them, this is not what they consider a good thing. Sometimes we like to hide things from even our selves. Making things easier for beginners is great, but this crosses the line into breaking things that work for everyone else, and seriously comprising power-user tools. At this point, it’s possible to have 27 years’ experience with the Mac, and there’s a considerable body of working knowledge in place. Fundamental changes risk breaking the functions people depend on, such as, you know, all-purpose computer stuff. Computer file system could use a rethink, but the iOS is not the way if you are trying to get work done. I’ve tried and tried to get work done on my iPad and it’s next to impossible because you can’t work on something in one App, and then open it in another. I’d like to rely on creative ways for Apps to work together, not just the way Apple thinks they should. Also, all the cloud stuff scares me. Where is the privacy? I don’t want everything I write to have to go to the cloud first where god knows who might get access to it. I think this is a serious question that no one is asking right now about iCloud. Are we so willing to turn over everything we create to corporations and governments? I know that makes me seem tinfoil hatish, but seriously, via the patriot act, they could read everything you write and never have to tell you. That scares me. I’d love Apple to come out and say that everything going to the iCloud is encrypted and they can’t even access it because the private key is on your device. But my guess is they will grant law enforcement full access to all your files if they get a court order. Is this where we are headed? That should give people pause. Uh, Roger you do realize that with a court order they can already open your safe deposit box, as well as your sock drawer. On the other hand, nobody cares about the latest dry cleaner website you are working on so there’s not much to worry about. Both your questions raise valid concerns, however, they were answered during Steve Jobs WWDC presentation. On the first point, the files remain as documents still, meaning separate from Apps, just easily accessible from within the Apps. However, because they exist independently, you can still use other applications to open them. Media files are good examples of that. Your photo from iPhone/iPad moves a copy (I’m not using the word sync) of it automatically to your Mac and/or PC (SJ said both). You can then use iPhoto, Aperture or Photoshop to do the level of work that suits your need. I would assume same is true for text files, or CAD files or Video files etc. So far, no reason to think otherwise, and if Apple does get rid of Finder it will have no bearing to the physical existence of the file. Think of the way Apple initially considered ZFS file structure where all files are always accessible from anywhere, the user just doesn’t have worry herself of storing them at a certain place/folder. Apple stepped away from ZFS due to licensing/legal issues, but this Cloud has allowed them to make Finder less prominent. Many of the future innovation now can reside on the server side. Your second point, raise security concern. I’d add to your excellent point that the security becomes an issue not only when your personal file/document start its existence on the Cloud, but even during the transfer. What if someone can grab a copy during the file transfer even in https mode, and crack the security alogorithm. Would the financial institutions allow those machines at their work place? And therein lies your answer. Apple knew about it, and during the presentation they showed that you can turn off cloud anytime for any or all files on your computer. It’s a free feature for you to explore and enjoy but never forced to. You can turn off cloud copying by default or during a document creation. Simply click on the title bar and it presents the option to not use the cloud. . It has taken Apple decades (as Jobs put it) to think about the Cloud solution, and I wouldn’t ask you to put your trust on them, but simply give them the benefit of doubt before you get a chance to play with their latest vision hands-on from an Apple Store first. As much as Im all for a more simplified system – especially for the newbies – I never want to find myself in a position where I cannot organise my own files via the finder. I have a very specific way in which I like my files organised, and I can’t see myself ever wanting Apple – or any company – to change that. While I love the fact that iTunes looks after and groups all my digital media (music, tv shows and movies) for me, when it comes to my website and graphic design work, and my video production and editing work, I know how I want my files laid out, thats that. What I CAN see Apple doing is bringing in an option or a ‘transition period’. The newbies can use the finderless-version of Lion (or whatever it may be), while the old-school folk like me (all of 24 years old), can continue to use a system which we have learnt to deal with over the course of our computing lives. Keep the finder but improve it. In some ways Windows Explorer is better for managing content creation. Please do explain exactly how windows explorer is better at this. I am typing this on windows 7 so I would love to know. One way Windows Explorer is better: cut/paste of files in addition to copy/paste. Another: ability to view directory structure and file details without switching views. I much prefer Explorer to Finder, which is too simplified. Newbies = brainwashed IOS users. Somebody set a Pod(IPod) next to their bed at night and their brain was absorbed by ITunes. Apple and the new Lion/ICloud equal big brother! Ever notice that Steve Jobs is looking more and more like the bad guy on the screen in their 1984 commercial. Be careful or you will be absorbed and become a Apple Necromonger Slave(Pod Person) with your head in the clouds! You have no choice but to conform with Lion and the free ICloud. Your next! To all of your comments Chris in this thread, they are just so precious and adorable. no. the finder it outdated and needs to go.